This time of year I feel like my home needs a good “spring cleaning.” I want everything to sparkle and shine and smell fresh. When the sun is out, suddenly the windows look cloudy, the surfaces feel more dusty, everything clearly needs to be wiped off. Unfortunately, in my quest for everything to feel spring fresh and clean, I started to uncovered some very dirty and even dangerous secrets. Trust me, the word dangerous isn’t just for shock value or click bait. This is for real. 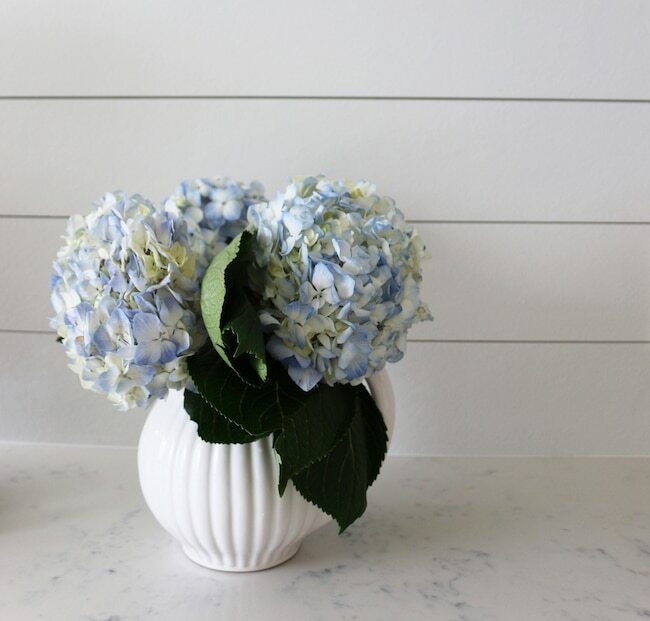 This won’t be a short post or even a pretty one, but it will have some of the most important “home improvement” info I’ve ever shared here on the blog. It hits close to home for all of us. You know I always feel better about life when my house feels clean. I know you feel better with a clean house, too. Our house has never been perfect and I don’t think anyone who knows me would consider me a total clean freak. I’m scatterbrained and sometimes messy. But I definitely feel a psychological boost walking into a kitchen or bathroom when things look, feel and smell clean. 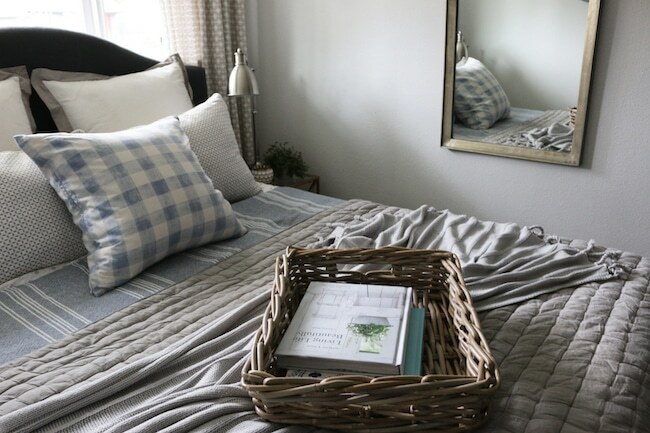 Trying to at least have a “clean enough” home has been something I felt was worth investing in not only for my own state of mind (you know everything is better when mama’s happy…) but for the overall well-being of our family. It felt good to know I was keeping our family safe from substances and germs that could harm them, providing them sparkling clean dishes to eat off of and fresh clean clothes to wear. I see myself and my husband as the “gatekeepers” of our home, as we are both eager to do whatever we can to make sure anything that enters our home is safe and healthy for our family. 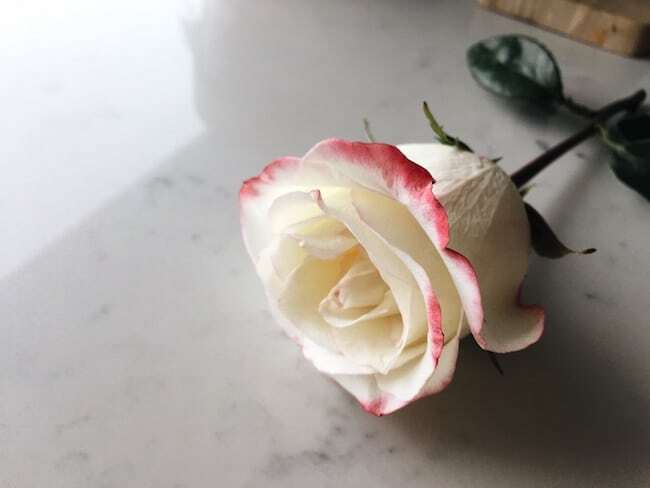 But much to my horror, even though we really have tried to buy safe products, I’ve been uncovering some disgusting and yes, truly dangerous things lurking in my home. 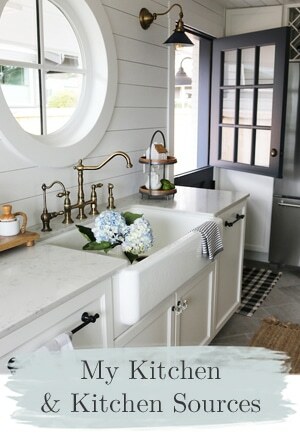 See my next post with simple changes for a cleaner home! I’ve discovered that products I invited in to my home because I thought they were helping our family (or at least just smelled good) may have been actually causing us harm. Products I just assumed were safe actually contain toxins, known carcinogens (! ), endocrine and reproductive disrupters, allergens and more. Over the last couple of years I become even more mindful of the products we were using. The more I researched, the more I was crushed to discover more and more dangers in our home environment. In a study I read online, the U.S. Department of Health and Human Services found 287 chemicals in the umbilical cords of newborn babies (passed on to them in utero) many of which are linked to cancer, birth defects or known to be toxic to the brain, endocrine and nervous systems. We likely come into contact with hundreds of harmful toxics in the course of a day. Our immune systems were created to protect us, but we’ve designed an environment that has us living in a toxic soup, a complicated and potentially deadly mix of chemicals our bodies likely can’t process or deal with. Believe me, I’m not a fear-monger type, but thinking about this stuff really inspires me to take responsible action and be far more cautious about what I bring into my home (and leads to me here to tell everyone what is potentially lurking under their sink, gah!). Just like when my son was a baby and I had to figure out all the fancy names for “milk” and check for artificial colors and preservatives in food ingredient lists (I wrote about that in my healthy home post), I realized awhile back that I needed to take our health safety even further and really question more of the products we had in our home. For years I lit candles and spritzed synthetic sprays around our home to make the air in our house smell good. I bought convenience items like cleaning wipes. I looked for the ones that were more powerful because I thought that meant better. But here’s what I’ve been learning. When you see the word “fragrance” listed on a product, the company isn’t required by law to disclose what ingredients are used to produce that fragrance. Many fragrances actually contain “phthalates” and preservatives which are harmful, but each substance doesn’t have to be listed individually on the label. The word “fragrance” could include endocrine disrupting toxic chemicals that don’t have to be specifically identified other than “fragrance”. Watch this video on the disturbing truth about candles and air fresheners. Even if a label says a product is “natural” it doesn’t necessarily mean it is all good. There could be one natural product and several “non-natural.” We would also need to investigate further the practices and policies of the company to know their policy on quality, as well as the exact process and ingredients they used to know what “natural” means on the label. I started researching the ingredients found on the labels of the products I was using. That was scary. If the label said “natural ingredients” I’d research the company to see if they had any published standards of quality. I even discovered that some of the companies assumed to be “safer” been bought out by other companies that I knew I didn’t trust. Goodness, why did finding safe have products have to require so much stress and effort? I’ve been working on creating a healthier environment for my kids since they were little (as I shared in my health story). We weren’t as “crunchy” or as diligent in label reading as we should have been back then, I can see that now, but we tried to be careful when we knew of and believed in the dangers. I’m so relieved that we were as conscientious as we were considering where we could have gone wrong, but it does make me feel sick that we were still so unaware of many potential dangers under our own roof. For everything we knew and did right, so many other things didn’t even cross our mind! I’m sure you feel the same way. But every year I try to learn more because I see how our health was compromised in the past in obvious and potentially not-yet-discovered ways. And every year I’m more appalled at what is still sold to us, I get more mad at what is swept under the rug, and frustrated by what I didn’t know or change in our home as quickly as I should have. These products were not just in our house, but quite possibly in yours, too. It’s hard to process that even while trying to be the best mamas and home-makers we could be, we may have been unknowingly bringing such harmful products into our own home. Over time, those toxins can build up in our homes and in our bodies, potentially causing cancers, diseases and conditions. So believe me, at our house the entire meaning of a clean home is being turned upside down. It literally makes me sick to even think about how many toxins could be in our home even now. 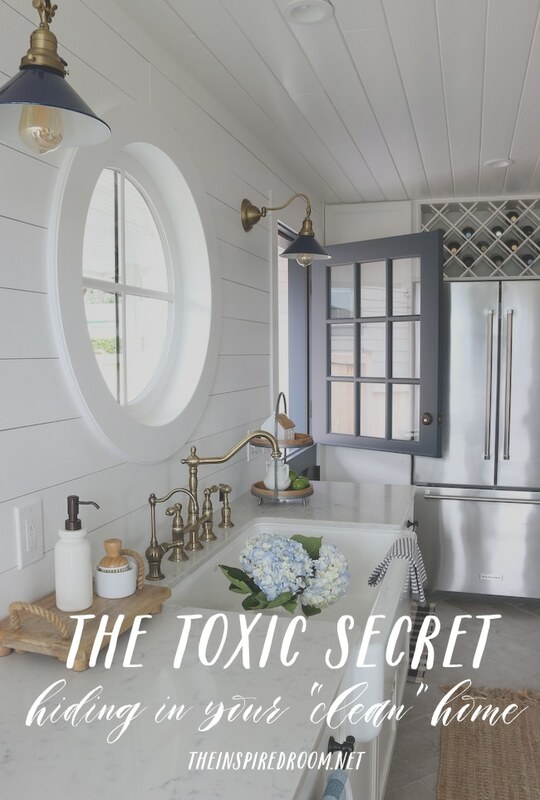 It’s not pleasant to talk about, but it’s too important to our family and to anyone who cleans or beautifies their home, bodies, hair, dishes or babies to just “sweep these toxic secrets under the rug”. We can’t pretend this isn’t real, it is real. Those dangers have been right under our noses, brought into our kitchens, placed under our bathroom sinks, sprayed on our counters, used on our dishes, gently wiped onto our babies skin, put in and on our bodies, on our clothes, in our hair. People are literally getting sick in their own homes due to toxins in the products they use to clean and beautify all the things. But guilt doesn’t change the past, does it? And there are no guarantees of perfect health, even if we got it all right. So we need to let go of those regrets and not live in fear or panic; those things don’t serve anyone well. This knowledge should propel us to make changes as we go and commit to learning all we can about moving forward with wellness. I know there are many other things that will likely need to change in time, but we have to start somewhere. Anywhere is better than not at all. We need to get back to what God intended for our wellness. Our bodies are amazing at healing when we give them what they need to be well. They even start to tell us when something isn’t right. Good healthy food from truly organic farms, plenty of clean water, exercise, and plant-based products, not toxic chemicals, will promote greater wellness in our bodies. 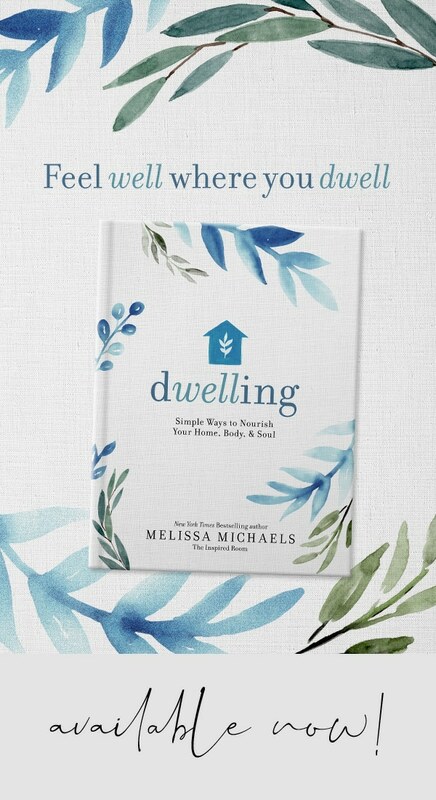 We don’t need to fill our home with anything that compromises our well-being. But it’s true, any of us can KNOW or believe something isn’t right and still not take steps to change it. Some people still roll their eyes when “wellness” conversations come up, and then will go right back to spraying chemicals on their bodies and dishes and inhaling them every single day as though they don’t want to believe the risk! Ack! You can research these toxins, ingredients and risks yourself. Don’t take my word for it but don’t just sweep it all under the rug. Don’t trust everything you read on google or find on an app, don’t panic, but definitely don’t assume all products sold in stores are safe or not harming you. It’s hard to unsee or not take action if you have done your own research and uncovered things you don’t want in your home. In my home, we are redefining what a truly clean home means. Our home may sparkle. It may shine. It may smell good, but it won’t be because we fake cleaned it with chemical toxins. So what do we use? We use plant-based methods to clean, truly clean, our home. We have found plant-based cleaners we trust that not only clean our house well, but they contribute to wellness and a better quality of life for our family. 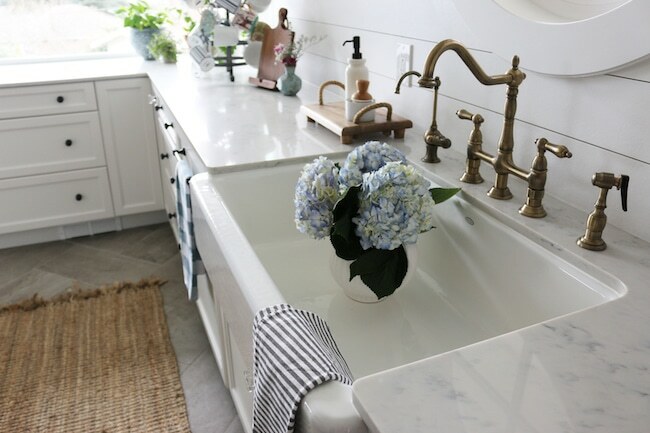 It’s NOT hard to get rid of all the junk under the sink. Yes, we spent hard-earned money on those carcinogens. It’s true, we invested funds in those hormone disrupters and reproductive and developmental toxicities. This is one time we definitely don’t need to get our money’s worth before we replace products. Toss those toxins out and never look back. It’s not too expensive or time consuming to be healthy, it’s actually way more expensive and time consuming to be or get sick! We absolutely have to redefine clean. It’s not what we’ve been told; it’s not what we might have believed. 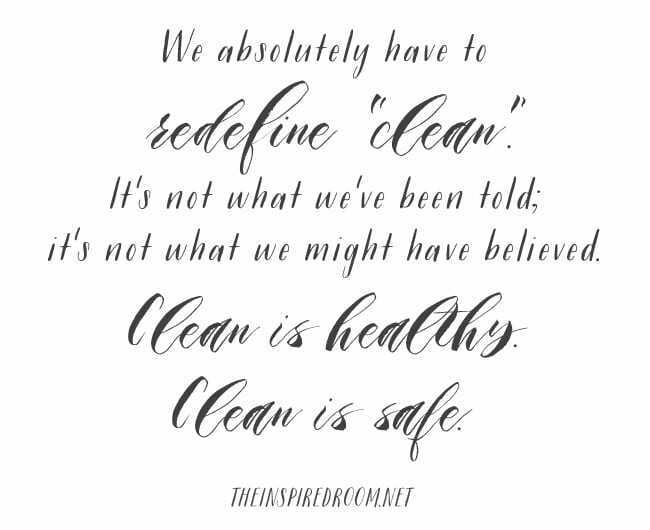 Clean is healthy. Clean is safe. Tomorrow I’ll share some of the changes we’ve made in our home. I’ll offer some great DIY recipes and specific ways we’ve replaced harsh chemical products for a healthier home. If you are ready to ditch those toxic products immediately and don’t want to wait to learn more, I applaud you for taking swift action. 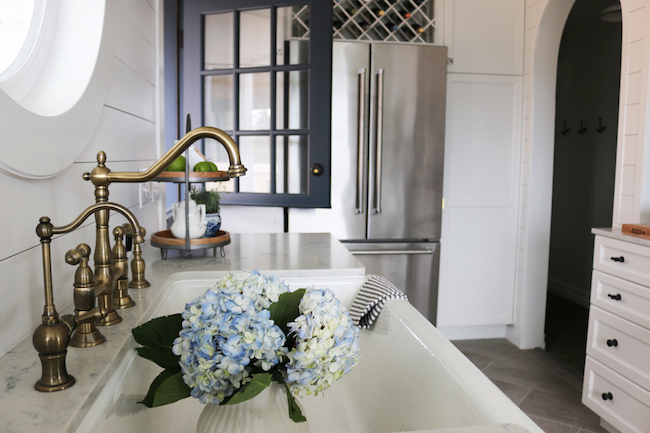 I’m happy to encourage you in this journey and give you some tips and product ideas we use so you can get started right away and truly clean your home for good. Here is a link to some wonderful and effective plant-based products my family trusts and has used for the past few years (and information on joining our wellness group where we clean out our homes together!). Update 2019: I’m happy to say I continue to feel better than ever, thanks to the commitment to ridding our home of toxic junk and being far more diligent about what comes into our home. This journey to a healthier home will be eye-opening and inspiring, don’t wait! See you here tomorrow for helpful tips on really cleaning your home. Disclaimer: I’m not a doctor and nothing written in this article should be taken as a scientific fact, a prescription or as medical advice. This information reflects my personal observation and experience. Thank you for putting this topic front and centre. I think many people are still unaware of the dangers that lurk in these products. You’ve made a good point that going back to the way God intended is best! I try to use that as a guideline for food choices as well. Thanks for blogging about this very important topic! I too took this on many years ago “Clean” doesn’t have a smell we have all been programmed with added scents to everything that we are to believe that! Me too! Any Cetaphil alternatives you like? I have a very difficult time with fragrances – don’t get me started on Febreze…most appreciated. The product link is great. Thanks. I was using some skincare products with “bio” (organic”) in the name, only to have an allergic reaction. My doctor explained that “bio” doesn’t mean anything, especially if it’s part of a name. I increasingly rely on baking soda and vinegar for cleaning. We cook at home from scratch for most meals, using real ingredients (fresh veggies), so we know what’s going into our mouths. No mixes. Nothing prepared. 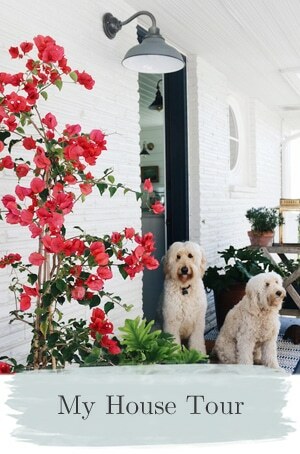 Opening windows, even for 10 minutes, is a good way to have a fresh-smelling home. I also put our duvets outside to air. Hooray, Melissa! Keep up the good work of telling the TRUTH! Our society needs this information so badly! We live in a swamp of chemicals and bad food, and until someone gets out of the swamp and starts calling it a swamp, no one knows it’s a swamp! We are sick and unhealthy and don’t realize that our food and our “cleaning” products are killing us! Thank you for sounding the alarm! That is so true, we need to get out of the swamp and blow the whistle. It’s just appalling! Thank you, Sallie. Can we use Thieves as an alternative to Febreeze spray? Also, is it good for toilet cleaning? I do use Thieves for cleaning and love it. Please share these answers on your blog. Thank you. Yes, you can definitely use Thieves for toilets and essential oils for room freshening. I am a 3 year cancer survivor and I clean homes for a living. I use all natural products such as: Vinegar, baking soda and castile soap. You can make a great cleaning paste with the castile soap, baking soda, sodium carbonate and natural oils (peppermint, tea tree and lemon). It works really well. Here is the recipe: 1/2 cup baking soda, 1/2 cup sodium carbonate, 1/2 cup liquid peppermint castile soap, 25 drops tea tree oil, 10 drops lemon or peppermint oil (add these oils last), and 1 cup water. You will have enough paste to last quite a while. Just mix everything with a hand blender. I use this for all the home I clean and they look and smell great. It’s called Think Dirty, I hope you’ll be able to find it! Interesting! Thanks for the tip, definitely worth looking into. Amen! I have been on my own health journey for the last two years as well. I can’t say enough for the changes I have made. I am still trying to learn and change as much as possible. Thanks for sharing. I still get the eye roll as well, but I am never turning back and I talk to anyone who will listen. Can’t wait to hear more!!! Be careful about jumping on the paranoia bandwagon. Excluding allergies to chemicals products, two points to keep in mind are (1) “natural” or “organic” doesn’t necessarily mean that a product is not harmful and (2) many products we use regularly can be carcinogenic or toxic if ingested in very large quantities. We don’t drink soap or shampoo and the minute amount that may remain on your skin after rinsing will never amount to dangerous levels. Skin lotion isn’t likely to be toxic unless you are maybe applying a bottle a day to your skin–you just don’t absorb enough to do that kind of damage. Same with air fresheners–unless you are spraying your entire house every 5 minutes, you aren’t going to inhale enough to be harmful. Fluoride toothpaste is toxic if you ingest enough of it, but who eats it? Yes I agree we do need to know more about the word “natural” and that we don’t need to panic but rather be educated so we make better decisions. One toxin may not be significant enough to warrant great concern, I agree, I think a healthy body could handle it, but with 62 of them layered in the average in a home we should definitely be aware of the potential impact, harm or risks to our health. My feeling is why maximize the risk when you can take steps to minimize it? That seems smart to me. I agree we need to practice critical thinking skills on our own. I do think the app is an easy starting point to learn, but we shouldn’t rely on any one source of information. I start with the app because it’s easy to navigate, but from there I may go to another site like ewg.org for more research and to cross reference findings, and then just start searching the chemical ingredients in question on my own. We all need to be letting these companies know that we re not happy with their products . It’s all so calculated . They get advertisers to suggest that we re just not quite clean enough and then suggest a new ‘ all singing, all dancing ‘ product. I ve seen an additional powder being advertised to add to our washing machines to get rid of even more bacteria ! Isn t just a good wash for a couple of hours enough. It’s all to make money for big companies. The same companies that suggest to us that crime is on the up and terrorists are about to burst through the door so that you buy sophisticated security for your homes and , unbelievably for us in the UK , guns. Thank you! I’ve always tried to be conscious about personal products and household cleaners but this winter I took another look and was again saddened and surprised to learn that many of the products I trusted for my family were in fact full of toxins. For instance Mrs. Myers brand hand soap is one I was surprised to learn to be harmful. 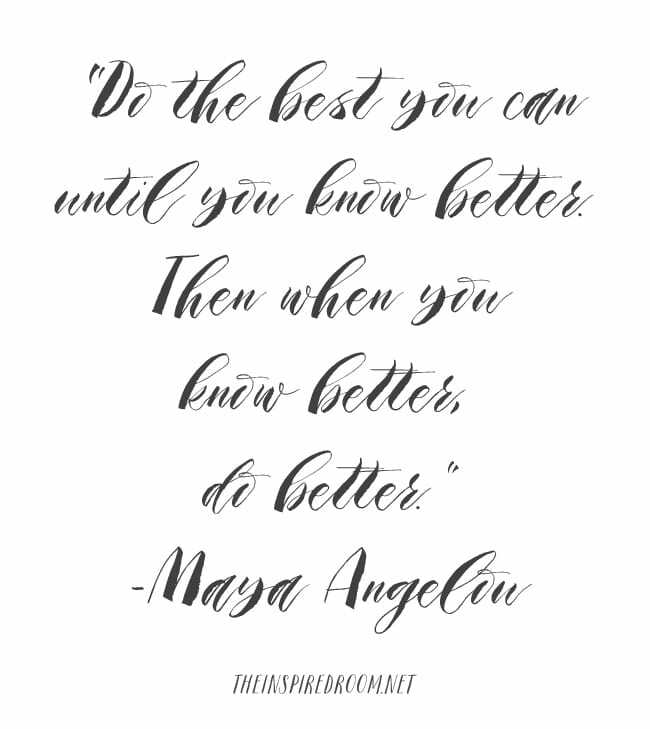 Thank you for your encouragement – know better, do better and trust God all the way :) Looking forward to tomorrow’s post! I love Grove, I just ordered from them yesterday. I’m selective though on what I buy and I’m always reevaluating if I’m uncertain. When you look up products on the app, you don’t want to just look at the rating. Look at the actual ingredients listed to see what it’s for. In some cases it’s the “fragrance” which would require further investigation to determine the company’s policy and actual ingredients. 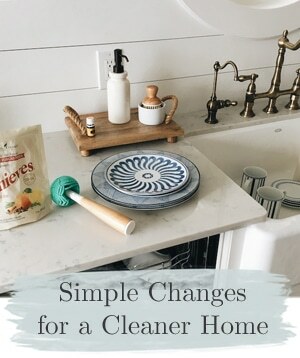 I explain that a little bit in today’s post >https://theinspiredroom.net/2017/04/04/simple-changes-for-a-cleaner-home/ hope this helps! Thank you for this. I’m one of those people who get poisoned by the chemicals of ‘so-called’ fragrance. I suffer hellacious migraines and throwing up from being around fake perfume, air fresheners, candles. And it’s everywhere in every thing! I’m sitting on the couch right nursing a migraine following packing up some things from my moms apartment that is LOADED with scented detergents, candles and cleaning products. Ladies…stop poisoning your families and friends! Listen to this post! Get educated. Thank you SO SO much. I have eliminated so many potentially dangerous products by using Norwex microfiber Envirocloths and only water to clean JUST ABOUT EVERYTHING…from plain ole dirt to raw chicken juice to bathroom grime. The extra-fine microfiber removes the germs without having to use chemical agents to kill them. Have y’all ever tried Norwex cloths? LOVE Norwex products! It’s all I use to clean and makes cleaning go much quicker! Thanks so much for your post. As a mother and grandmother I try to look for safe products and I look forward to your next post. Hi Melissa! This has been a hard topic for me. It is so overwhelming to pick the right products and half the battle is that brands are not completely honest. Over the past year or so I have started switching over to more natural beauty products but have been struggling with finding the right ones that work well for my skin, are at the right price point, and are easily accessible to me. It takes time and effort to do the research. I read your article this morning and shrugged it off. But I ended up thinking about it all the way into the afternoon! I got a chance during nap time to sit down and look a little more – comparing products to find the right fit. I think I may have found what I was looking for! Thanks for sharing this encouragement! The life expectancy age is actually going down, every disease is on the rise. We are just exposed to so many chemicals. It’s doesn’t just affect us, but the animals around us. I heard recently that the amount of animals on the earth have decreased by over half in the last 30 years!! Yikes, if that’s true! I’m glad more people are becoming more aware of the problems these chemicals cause. That’s really interesting, thanks so much sharing that. I am always wondering if it isn’t necessarily a single chemical that may cause a disease, but the sheer volume or combination we are exposed to in our environment these days. That’s why I just feel like why not reduce as many as possible (we don’t need them anyway!) rather than just decide it isn’t something we don’t need to worry about, or assume disease is not something we can avoid. 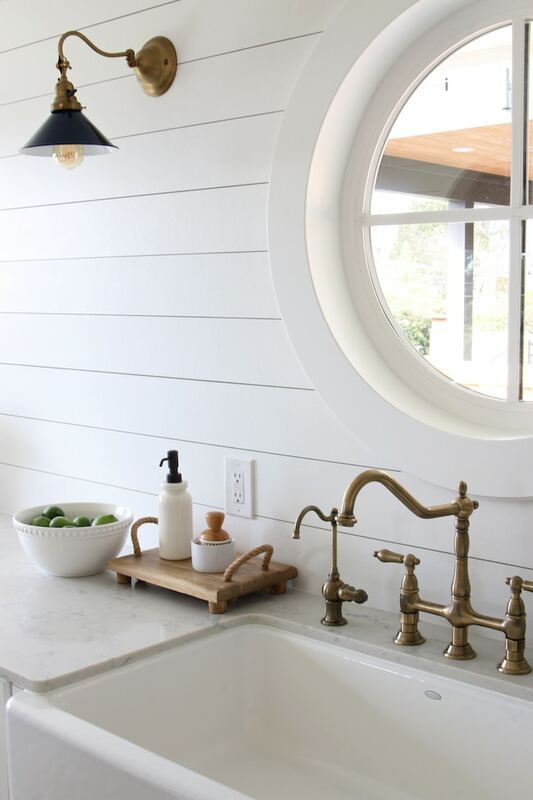 Where did you find your beautiful soap dispenser next to your kitchen sink?! I think that was from Target years ago! I love that this is getting talked about. Its so serious! Good gravy, what’s a gal suppose to use? We use all those products except for the Secret deodorant; we use Arm and Hammer brand. My eye doctor recommended using the Ivory soap on my hands before inserting clean contacts in my eyes. It is the only soap that does not leave a film on my skin….others leave oil finger prints on contacts lens. So what soap do we use? I love a clean home. I watch our two grandchildren ages 2 and 5. What should I be using for them? Please help! Thank you for the post. Hi Joyce, I will share some products and DIY options we use in our house in my post tomorrow, so stay tuned for some ideas. 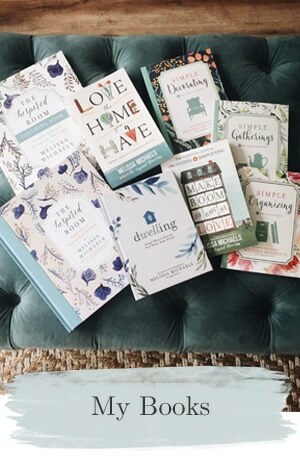 You’re welcome, I hope by sharing some resources, we can all be more alert to what is in our home and make choices that make sense for our family. I also use the Norwex with great success and feel the house stays cleaner longer. I love the Thieves and am interested in how you utilize the essential oils – looking forward to the next post. We re becoming a bit obsessed about this need for zero bacteria and germs . Our bodies were designed to build up immunities to certain virus’s and germs by coming into contact with them and if you believe in a God then surely that’s why we were given this ability.We are weakening our immune systems and our communities by obliterating every last little germ with all these toxic chemicals . There is a lot of advertising/ propaganda by the companies that sell these products to get us to buy and we need to rethink our reliance on them . Sensible cleaning , hand washing and food handling rules , yes . Bleaching everything excessively , no. Also using talc on babies particularly girls has been known and advised against in the U.K. for many years. I have 5 babies and keep a very clean and natural home on a BUDGET. Vinegar and baking soda foam to clean about anything, toilets to floors, etc. Add lemon juice for countertops. Organic olive oil is a great skin cleanser and makeup remover, as well as being anti-aging. It’s all I wash my face with. Argon oil is also fantastic but pricey. Organic coconut oil is lotion for bodies and smells great! Target has some better choices (maybe not perfect but make wise choices NOT fearful ones!!) such as Shea Moisture soap and hair shampoo/products. JR Watkins and Mrs Myers soaps are good. Start looking for “paraben and sulfate free” etc. Check your new furniture for the tag on the bottom before you buy to make sure it has no added flame retardants. Whenever possible only buy natural 100% cotton or linen fabrics for your sheets and towels and throws. No acrylics or polyester etc. Same for clothes you sleep in. Start there. Take the wire out of your bras and insist on cotton underwear. Fresh air is your friend. Crack windows and let your house breath. Small changes make a big difference!! Thank you for being a voice for toxin-free living! LOVE, LOVE EO’s and Norwex! As I said this spring cleaning series was two parts. 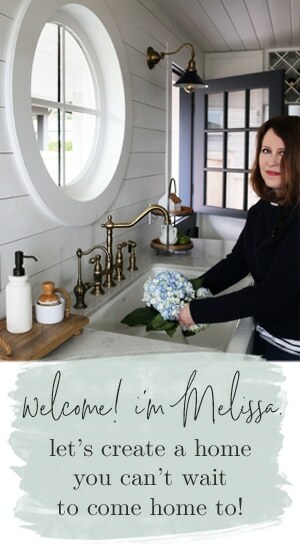 For the past ten years I’ve always written free posts for readers on a variety of subjects I’m interested in through each season: housecleaning, homemaking, decorating, organizing, lifestyle, authenticity, remodeling, seasonal posts, products I use and shopping guides etc. You may not be interested in every topic but hopefully some will be of interest. I am glad to see people are waking up to these toxins. Thank you for drawing attention to it. It took me years to realize how much dangerous gunk companies added into their products. When I moved from the USA to Europe, my shopping habits changed considerably. I started paying closer attention to what I was buying. A LARGE amount of ingredients used in American products are completely banned in Europe. In food alone, I saw significant improvements in my health. A lot of stomach/GI issues occur in my family, and mine completely disappeared once I moved here. I went above and beyond by not buying anything with artificial ingredients such as aspartame or sucralose. As for cleaning products, I found things such as formaldehyde in some of the products I looked at (carcinogen). I hadn’t even thought to look at my shampoo. I will be looking more extensively at the health products in my home too. Thanks! Wow! That’s interesting (and crazy! ), thanks for sharing and comparing notes on what you’ve discovered. Thank you! I’m new to your site so forgive me if you’ve already posted this somewhere. Where is the small wood tray with rope handles from? I know there’s lots of chemicals in products, but I find natural products don’t clean as well. I do like mrs. Myers products, though. I used Johnson baby powder on my kids when they were babies, too, and I am terrified how talc is so bad. Causes camcer. Scary. I used to have a great Swedish blog with information about chemicals in Swedish products. It’s not updated anymore, so now I’m looking for another way to get good tips about additives and such. Do you know if this app works on other markets than the US? I just found your Facebook page and website today. After seeing this article about toxic ingredients in everyday household products, I wanted to add my $0.02. It might be heresy to some people, but consider completely quitting anti-antiperspirant deodorant. That stuff, plus shaving, might make armpit skin darken, in addition to probably causing people to sweat and stink worse than they would without any chemicals.